Jules and I were having so much fun the other night when I was giving her a bath. And then I though of my little sister who was terrified of baths when she was a baby. It was hard for the whole family to deal with. I wish I knew then what I know now, so, I could help my parents make bath time more enjoyable for my baby sis. But I didn't. So, I'm sharing my 'wisdom' with you and hope you can put it to good use. Here it goes. Bath time is a great way to bond with your bundle of joy. But while some babies love their baths, others can be anxious about splashing in the water or being washed. If your baby fusses through her bath time or you just want to make taking a bath more fun, try these 10 techniques that will help make bath time more enjoyable for you and you baby. Keep your cool. Babies have an amazing ability to sense what you are feeling. If you are worried about bath time, then you baby will too. To help yourself be more relaxed, get everything you need in advance. Bring a washcloth or sponge, baby shampoo and body wash, lotion and towel. If you like to dress your baby right after her bath, you may want to grab a baby gown or some other baby clothes. When Jules was little, I used to spread a baby blanket on the bath floor. I would put Jules on the blanket to dry her up and wrap her in a towel. Hop aboard. If your baby seems to be afraid of water, try getting in a tub with him. Skin-to-skin contact is believed to be a great way to bond with your baby. In addition, your closeness will calm him down and help him feel secure in the water. Be careful not to slip when you are getting out of the tub, however. If possible, have your partner or someone else help you out. Make bath time a play time. You can make bath time special by having designated bath toys that your baby enjoys playing with. For smaller babies, use rattle toys, unbreakable mirrors or squirt toys. As your baby gets older, consider getting staking cups and bowls to teach her about filling and pouring. 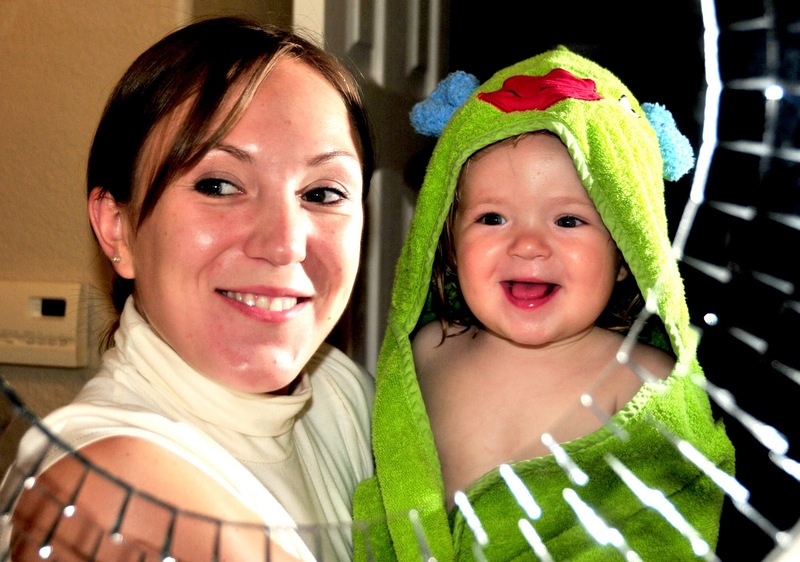 A toddler might enjoy a squirt gun or a bath time doll that she can wash. If you are more into learning toys, you can get your babe foam letters, numbers or animals that stick to the bath tiles. Give your baby time to play and enjoy herself before and after you wash him. Tickle her senses. Bath time is a very sensory experience – which can be overwhelming for some babies. If your baby is enjoying her bath, create more sensory experiences by letting her touch different textures, like the surface of a sponge or hair brush, or gently sprinkling water over her belly and hands. Blow bubbles. Babies are mesmerized by bubbles. Let him watch bubbles float in the air, feel them burst against his skin or catch them as they hover over him. In the meanwhile, you can teach your baby such concepts as big and small, high and low, shiny, light and so on. Get creative. Does you baby like to paint? Then he probably likes to get messy too! You can make cleanup easy by letting your baby paint in the bath. There are many bath time finger paints and bath crayons that you can chose from. Tell her a story. At young age, babies really enjoy hearing your voice. So, talk to your baby throughout her bath time. Tell her about what you see, what you are doing or will do next. Older babies might enjoy hearing a real story. You can get a few bath books and hand puppets or turn bathing into a real adventure with pirate ships, treasures and secrete bubble maps. Make getting out of the bath just as fun. Some babies enjoy bath time so much that it’s getting out of the tub that’s really stressful. Make it easier on your baby and yourself by coming up with fun little rituals. For example, once I get Jules out of the tub and wrap her in a towel, we peek in the mirror and I ask: “Who is that pretty little girl?” She loves it! Then I let her turn off the lights in the bathroom and we peek in every mirror on the way to her room. Did these tricks work for you? Or do you have your own little secretes on how to make baby’s bath time more fun? Please share!